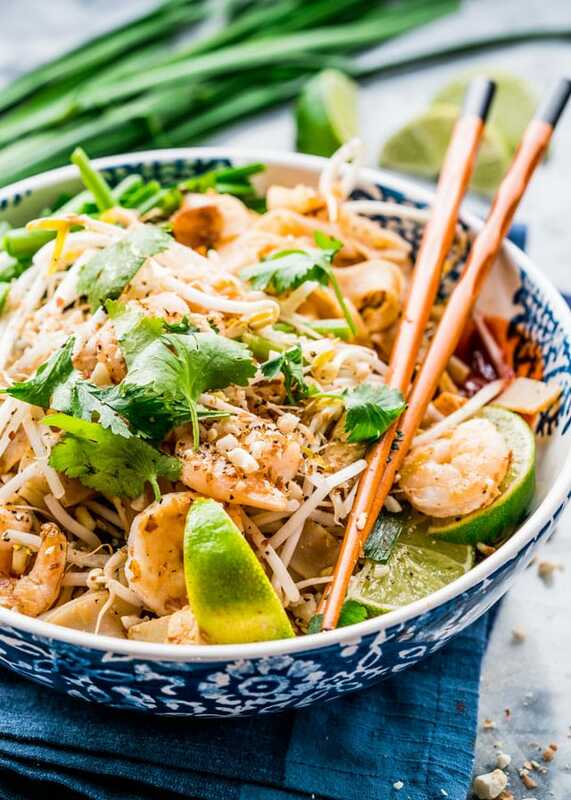 This Pad Thai with shrimp and tofu gives you all the flavors and taste of the authentic Pad Thai, in the comfort of your home. 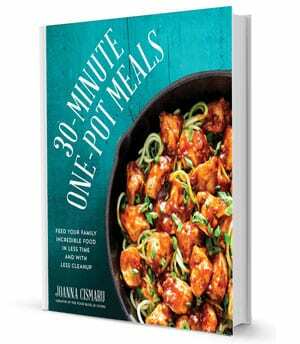 Who needs takeout when you can do this in less than 30 minutes! One of my favorite dishes, if not my favorite dish to order at a Thai restaurant. When I worked in Michigan I used to go often to Thai restaurants with friends, it was our choice over any other cuisine. It was probably a cuisine we used to have at least a couple times a week. I kid you not. We had a Thai restaurant not 2 minutes from our office, so it was close, it was fast, and it was pretty delicious. This was years ago. Since then we moved to Calgary and there are only a couple Thai restaurants here that I know of. I’ve been to them and the food is just as good as I remember. However, I love to make this myself at home, because let’s face it, nothing beats homemade food. Don’t be scared of the list of ingredients. Some may be hard to find like the dried shrimp or the Chinese chives, but I have provided substitutes for them all. 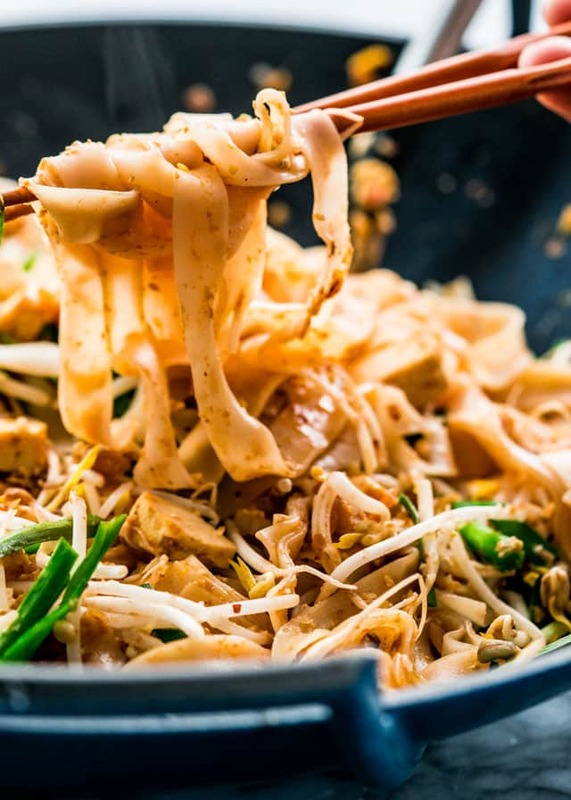 However, if you have a good Asian market nearby, I really recommend going there and buying all these ingredients, because they are what make this dish unique and what gives the flavors we know and love of Pad Thai. Usually I try and stay away from dishes that require unique ingredients, but I really wanted to share this recipe with you guys, because it really is one of my all time favorites. By the way, Pad simply means stir fry, so Pad Thai just means Thai stir fry. The whole idea to making this dish is mise en place. I’ve explained mise en place before, and it basically means getting all your ingredients ready first, including chopping your vegetables, chopping the nuts, making your sauce, etc. If you do all this first, then the dish is a piece of cake, because basically all you have to do is cook the ingredients, which takes no time at all. These dishes are usually cooked in a wok over really high heat which is why they cook so fast. Every time you add something, you basically just cook it for 30 seconds, add the next ingredients, another 30 seconds, more tossing and that’s about all there is to it. Which is why preparing your ingredients first makes all the difference. Once you start cooking you do not have time to go and chop this or that. Although I used a wok for this recipe, a large skillet will work just as well. You will love the flavors in this dish. 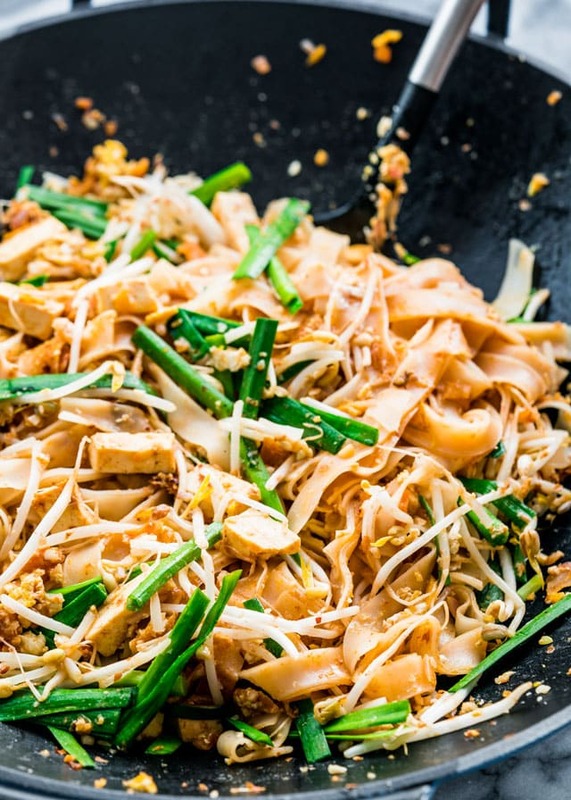 It will be bang on to what you know and love about Pad Thai. I hope you give this dish a try, especially if you’re a fan of Thai food. Sometimes it’s good to get out of our comfort zone. You won’t believe what we can achieve. Host a fun #takeoutfakeout night for your family and friends with some other recipes like Pad See Ew and Beef Broccoli Noodle Stir Fry! Place noodles in a large bowl. Add enough cold water to cover them and let them rest for 1 hour or until noodles are pliable but not soft. Drain well in a colander. They will change color from translucent to white. In a bowl combine the shallots, garlic, dried shrimp, radishes, tofu and Sriracha. In another bowl combine the bean sprouts, chives, and 1/4 cup of the peanuts. In a medium skillet heat 1 tbsp of peanut oil over high heat. Add the shrimp and cook and stir about 1 to 2 minutes or until shrimp turns pink and starts to slightly char. Transfer to a bowl. Add the rest of the oil to the skillet or wok. Add the tofu mixture to the skillet and saute for about minute. Add the noodles and sauce to the wok and toss everything. There is water in the sauce so the noodles will cook and absorb the liquid. Move the noodles to the side of the wok and add the egg and break the yolks. Add a bit more oil if necessary before adding the eggs. Let them cook for 30 seconds then scramble them. Toss everything together. Add the bean sprouts and chives mixture to the skillet and toss everything. Turn off the heat. To serve divide noodles mixture among 2 or 4 plates, depending on the size of the meal you want. 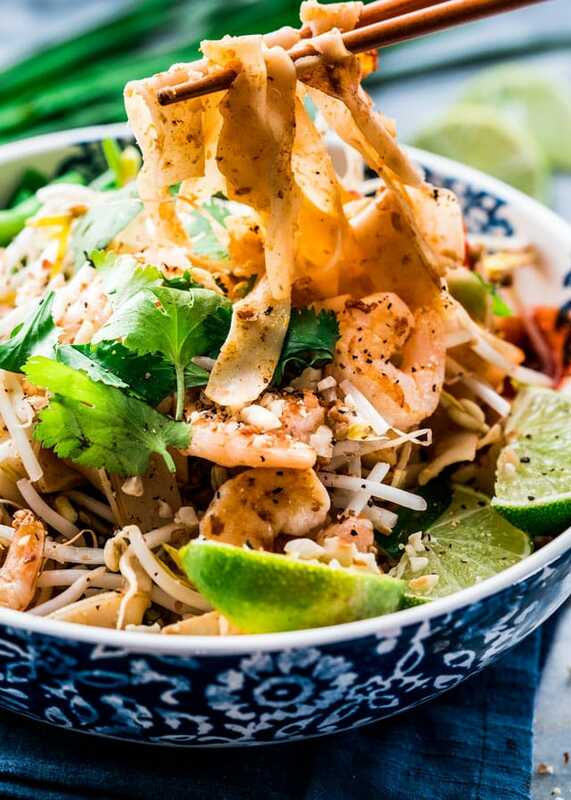 Top with shrimp then sprinkle each serving with bean sprouts, extra chives, peanuts and lime wedges. Serve with fresh cilantro and Sriracha on the side. 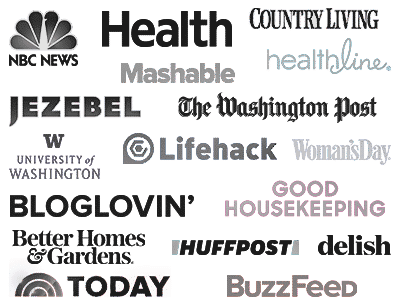 Tamarind paste is a common ingredient used throughout the world. The paste is prepared from tamarind, which is a sticky sour tasting fruit that grows on bean-like pods on tamarind trees. Tamarind paste is both sweet and sour so I would substitute it with equal amounts of lime juice and brown sugar. Chinese chives (or garlic chives) look like regular chives but much bigger and leafier. They could be considered more vegetable rather than garnish. They are garlicky in flavor, juice and crisp in texture. Look for these chives in Asian markets. They can be substituted with regular chives or scallions. Dried shrimp are shrimp that have been sun-dried and shrunk to a small size. They are used in a lot of Asian dishes and give a unique umami taste. They can be found in Asian markets. Shrimp pastes can be substituted for dried shrimp. please tell me what are: UDON NOODLES. I can’t find them in my grocery store. May I substitute something similar? My noodles didn’t turn out very well but they were brown rice noodles. I went to three stores looking for them and finally found them. They are simmering right now Im hoping for the best. Everything else seems right. You’re very welcome, I hope they turn out good. Your picture looks beautiful! 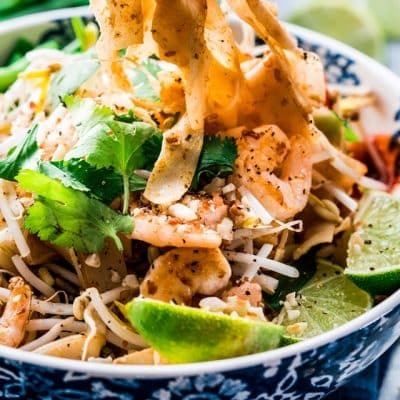 Love pad thai – look forward to trying this recipe! I love Thai food and always try to recreate recipes of the Thai dishes. 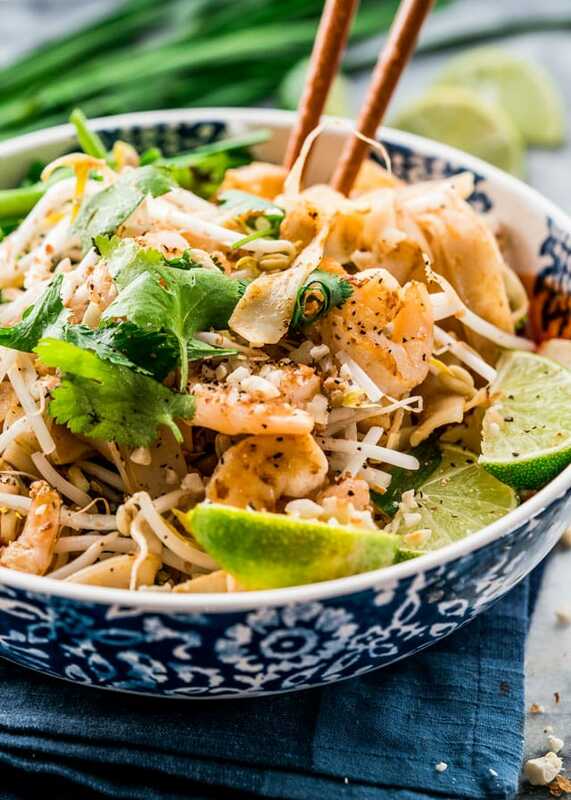 Your pad thai looks very delicious on your photo! Pad Thai is my favorite! I always order it at Thai restaurants, as well. I tried making it at home once and it was a big fail. I will have to try your recipe out!